The Hot N Cold Fantasy Baseball All-stars for Fantasy Pros 911: http://fp911.com/the-hot-n-cold-fantasy-baseball-all-stars-3/. The All-stars include Adam Dunn, Matt Joyce, Cody Ross, Juan Francisco, Alcides Escobar, Jason Kubel, Alejandro de Aza, Nick Hundley, Mat Gamel, Brent Lillibridge, Darwin Barney, Eduardo Nunez, Phil Humber, Wandy Rodriguez, A.J. Burnett, Jeff Niemann, Anthony Bass, Albert Pujols, Matt Garza, Chad Billinglsey, Brandon Morrow, Austin Jackson, Jeff Francoeur, and Zack Cozart. The Chicago Cubs: Pitching their way into the Hearts of Fantasy Baseball Players: http://fp911.com/the-chicago-cubs-pitching-their-way-into-the-heart-of-fantasy-baseball-players/. A look at the soaring value of Matt Garza, Ryan Dempster, Travis Wood, Chris Volstad and others. A look at fantasy baseball starting pitchers and their ranks for 2012. The post includes in-depth analysis of Yovani Gallardo, Jon Lester, Matt Garza, Ervin Santana, Ted Lilly, Edwin Jackson, Jeremy Hellickson, Jaime Garcia, Sean Marshall, Jair Jurrjens, Ryan Vogelsong, Ryan Dempster, Colby Lewis, A.J. Burnett, Henderson Alvarez, Travis Wood, Jordan Lyles, Homer Bailey, and more! Danny Valencia – I don’t really like oranges, but for some reason a Valencia Orange just sounds good. Or maybe it’s because Valencia is in Spain, perhaps my favorite country to visit (and one I’ll be going to in 8 days!). Anyway, I really want to like Danny Valencia (and seven-day stretches like his most recent (13/27 with two homers) make it easier), but I have to offer a word of caution. On the year, his HR/FB rate and gross HR numbers have improved in relatively the same amount of at bats as last year. Of course, the average is nowhere near 2010 levels. His .345 BABIP in 2009 was clearly not repeatable, but is he a .261 guy on balls in play? I can’t imagine it’s that bad especially given little change in his LD rate. Still, Valencia is not much more than a .260 hitter ROTW with maybe eight HRs. I get how bad 3b is, but Valencia could hurt more than help. 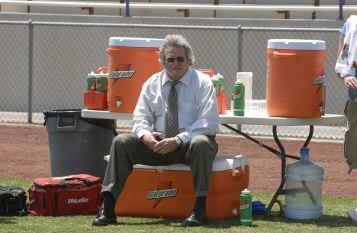 When it is Buddy Garrity sales time, you should be moving players immediately. These are players that will likely regress to means or not perform as well as they have been (i.e., sell high candidates).